The Radcliffe Institute for Advanced Study, the Harvard Alumni Association, and the Harvard Club of Southern California invite you to attend a reception and lecture by Jane Kamensky, Pforzheimer Foundation Director, Schlesinger Library. Wednesday, May 16, 2017, 6 p.m.
Register: There is no charge for this event, but RSVP is required. Click here to register! 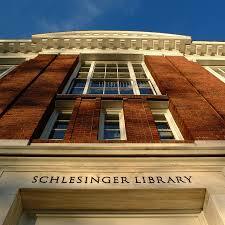 The Arthur and Elizabeth Schlesinger Library on the History of Women in America began in August 1943, as Radcliffe College’s Women’s Rights Collection, with a founding gift of 30 cartons of manuscripts and 300 books and periodicals. Today, the largest women’s history library in the country holds more than 4,000 manuscript collections, over 125,000 volumes, and troves of audio-visual materials. This illustrated lecture by Pforzheimer Foundation Director Jane Kamensky uses seven jewels from the Schlesinger’s collections to tell fresh stories of American history in the twentieth century and look ahead to the twenty-first. Topics will include women’s rights and civil rights, the sexual revolution and the remaking of the American family, and the actions and activism of American women abroad from World War II to the present day.